“And the third one, which is the centrepiece of them all – the most complex one – is Autonomy. I keep mentioning Autonomy because it’s gold dust. 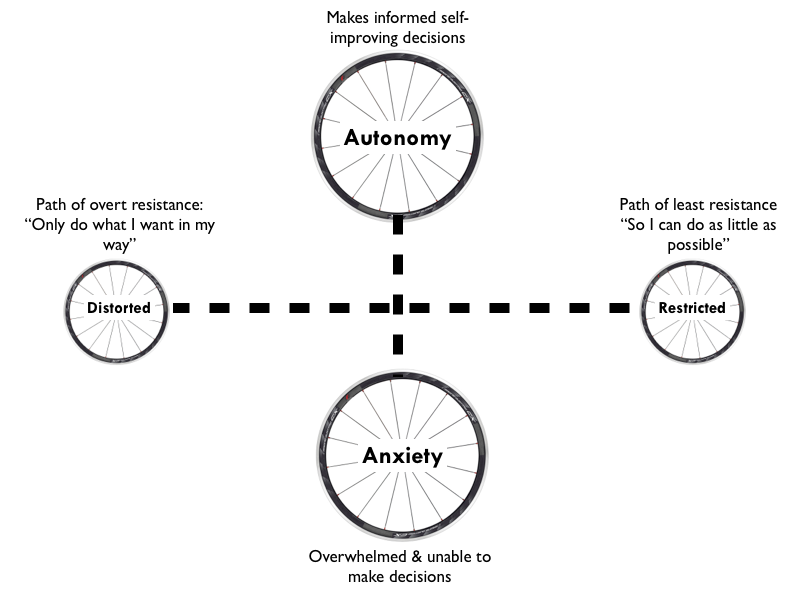 What is Autonomy? Autonomy is self-determination. How much scope or trust do I have? How much scope do I have for self-determination in my job or in my classroom? And the more self-determination, the more autonomy you have the more motivated you will be. The ‘Four T’s’ (inspired by Google / discussed by Daniel Pink in his ‘What science tells us about motivation’ TED talk / also in “Full On Learning”). The idea is that at Google, Daniel Pink explains that employees are given ‘20% time’ during which they are encouraged to work on whatever project they would like, with whoever they want to and present their concept or project in whatever format they wish. They decide when they will ‘deliver’ the project within the overarching 20% timeframe they are given. When it comes to lessons, it may be that rather than offer students whole-scale freedom (and risk high levels of ANXIETY that may, in turn drift into RESTRICTED or DISTORTED autonomous behaviour), you could offer choices in one or even two of the four areas. 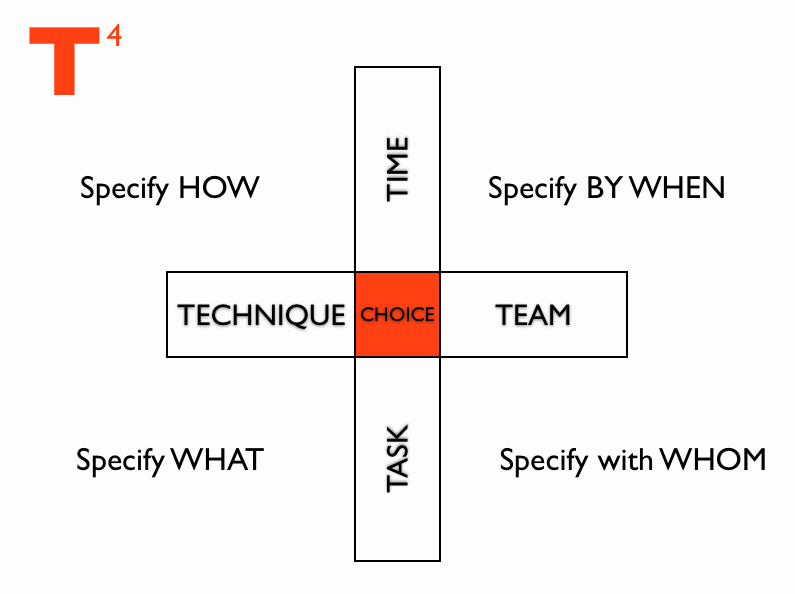 When you introduce new levels of autonomy, it may be that you simply offer choice in HOW the task will be presented (TECHNIQUE) but you stipulate the time by which it needs to be completed, with whom and the task itself. The MLG here involves you communicating and being overt about the choice that you are giving and, of course, using a SO THAT in your explanation to reassure students WHY you are doing it. You can then play around with each of the 4Ts you offer as part of the package of choices. You can also ask students to suggest a range of choice or options within the 4Ts that they can select from, so tat you are building choice within choice. SO THAT you can create a stronger link between an engaging thinking starter (designed solely to hook students into learning from the second they walk into the lesson) and the curriculum content you want them to grapple with during the lesson. 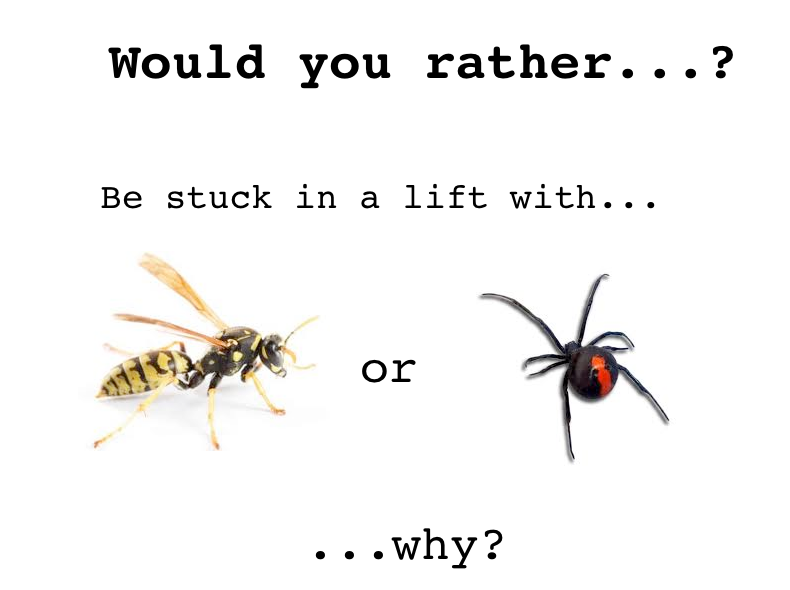 So here is an example ready for adaptation (using one of my favourite question stems “Would you rather?”). You’ll also find this example in my book, Full On Learning. A low input, high output slide that is apparently unrelated to ANY aspect of the curriculum. 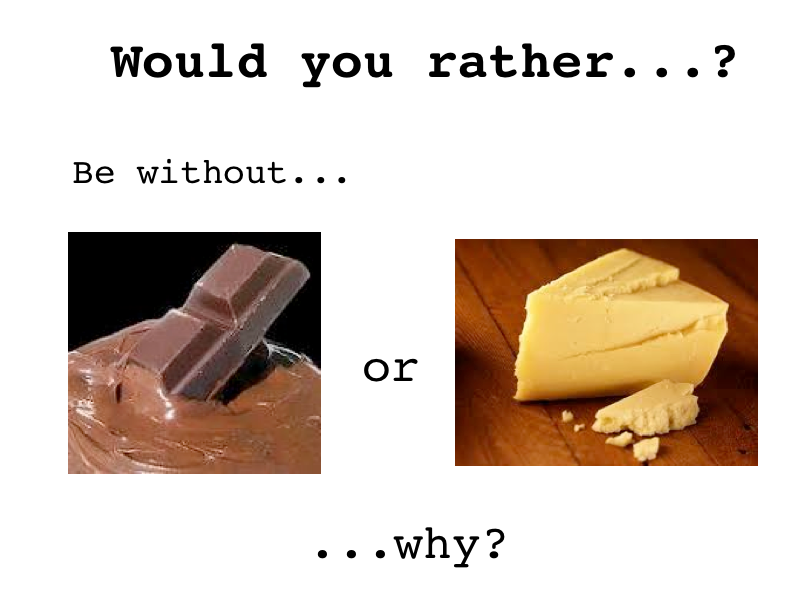 Here, the students are asked to make a choice between chocolate or cheese – what would they rather be without and why? You can adopt the strategy covered in AFFILIATION here, where you ask students to feedback the thinking that they have HEARD to ensure they actively listen to each other SO THAT they can share the thinking of their partner, rather than simply sharing what they’ve just talked about. Another ‘Would you rather?’ to practise their decision-making thinking and encourage the students to start to reflect on the criteria they need to develop to respond to the choice. In this instance, the criteria will involve discussion around what you really need to do to survive. 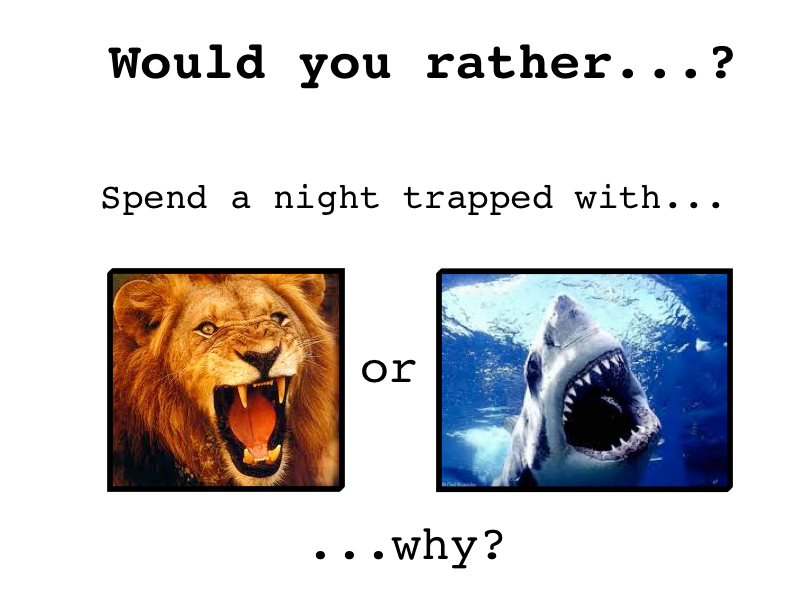 A ‘Would you rather?’ that explicitly encourages discussion of survival. It may be that you use this as a launch pad into exploring statistics, probability of survival, issues relating to environment, ethics….you get the idea. 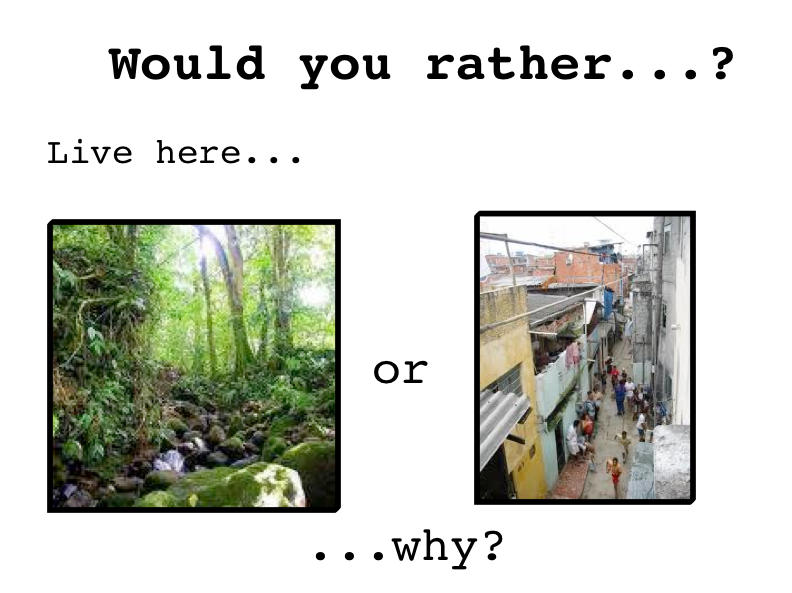 A specific curriculum related ‘Would you rather?’ which requires students to consider whether they would prefer to live in a rainforest or a favela. By this time, they have practised developing criteria as part of rationale to support their decision-making, rehearsed articulating their thinking, and can now investigate the topic itself at a level whereby they can apply highly developed skills of decision-making to a curriculum topic. When it comes to building autonomy into lessons, both of these examples exemplify how adopting an MLG approach can have an impact on both learning skills and curriculum expertise. This entry was posted in Autonomy. Bookmark the permalink.